The Gulf Tower during the day. At night, the top levels light up in various colors. Mood rings were a popular fad in the 1970’s. Flash forward and the concept of gaging our mood via a color is being applied to the Gulf Tower downtown. 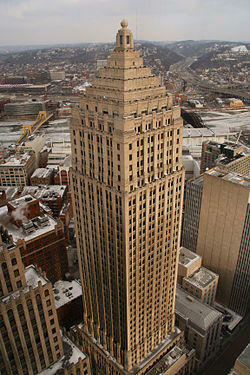 An upcoming exhibit at the Carnegie Museum of Art will use the Gulf Tower Beacon to reflect the city’s mood. We talk with Divya Rao Heffley, program manager for the Hillman Photography Initiative and Brad Stephenson, director of marketing for the Carnegie Museum of Art. Traditionally, the color of a mood ring was said to change determining your mood at a given time. In the past, the Gulf Tower beacon has displayed weather prediction lighting. Each tier signified with temperature or humidity levels. This week, the beacon will tell the people of Pittsburgh the mood of the city with two colors, red as negative and green as positive. The idea of the beacon is a lead up to an art show this Saturday, February 14, at the Carnegie Museum of Art called Antoine Catala: Distant Feel. Compared to ten years ago, we see so many more images everyday although it is not only quantity but the way we are seeing these images, says Heffley. The exhibition will show how technology changes the way we connect with and experience images. The mood ring might have been a fad that lived and died in the '70s, but the idea behind the fashion statement is coming back for all to see on top of Pittsburgh’s Gulf Tower. In promotion of artist Antoine Catala’s upcoming exhibit at the Carnegie Museum of Art, which explores people’s emotional reactions to images online, the skyscraper’s six-story weather beacon will reflect the positive and negative comments posted on residents' Instagram photos.